Broadband Wattmeter 2 MHz to 200 MHz, measures 1 Watt to 500 Watts average (RMS). Requires no elements, this broadband meter has five power ranges and reads forward and reflected power. -40 dB RF sampling port (BNC). Available with Type N, BNC or UHF quick change connectors. Specify your connector type during checkout. New with one year limited warranty. Broadband Wattmeter 2 MHz to 200 MHz, measures 1 Watt to 500 Watts average (RMS) power. Requires no elements, this broadband meter has five power ranges and reads forward and reflected power. Available with Type N, BNC or UHF quick change connectors. Specify your connector type during checkout. New with one year warranty. 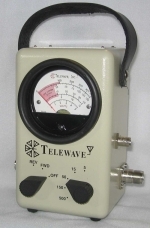 Broadband Wattmeter 20 MHz to 1000 MHz, measures 1 Watt to 500 Watts (rms). Requires no elements, this broadband meter has five power ranges and reads forward and reflected power. -40 dB RF sampling port (BNC). Available with Type N, BNC or UHF quick change connectors. Specifiy your connector type during checkout. New with one limited year warranty. Broadband Wattmeter 20 MHz to 1000 MHz, measures 1 Watt to 500 Watts (rms). Requires no elements, this broadband meter has five power ranges and reads forward and reflected power. Available with Type N, BNC or UHF connectors. Specify your connector type during checkout. New, one year limited warranty. Pelican 1200 Custom Storage Case for Telewave Wattmeters 44A, 44AP, 44L1, and 44L1P. 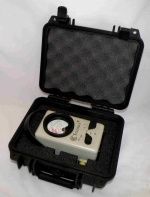 This sale is for the custom Pelican carry case only, the power meter is not included. This case is also a perfect match for Bird Wattmeters Models 43, 43P, 4314B/C, 4410A, 4304A and other Bird meters of the same design. The ultimate protection for your expensive and somewhat delicate wattmeters. The custom foam cutout completly isolates the wattmeter from any contact with the rugged, hard shell, water resistant case. Martin RF Supply 100% Satisfaction Guarantee. 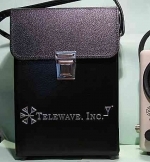 Telewave custom Leather Case for any of the above wattmeters. Bottom drawer opens from the back of the wattmeter for cables, adapters, etc.